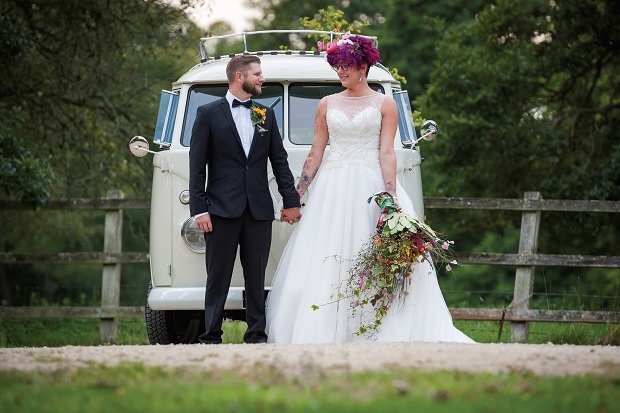 Faye and Tom first met on a school bus after she moved to live in the same village but it was many years later before Tom plucked up the courage to invite her out. “From our first dinner date we knew straight away that this was going to be a good thing,” recalls Faye. Tom popped the question on Christmas morning, which took Faye completely by surprise. “We were in bed with our dog Frank and I had no idea, not a clue he was going to propose,” says Faye. 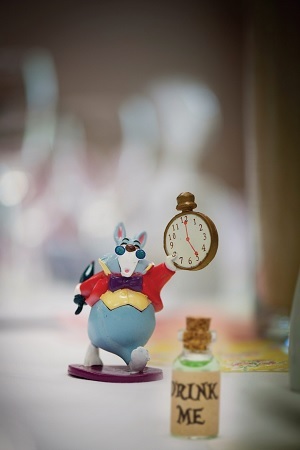 Both love the eccentricity of Alice in Wonderland and thought it would make a great theme. 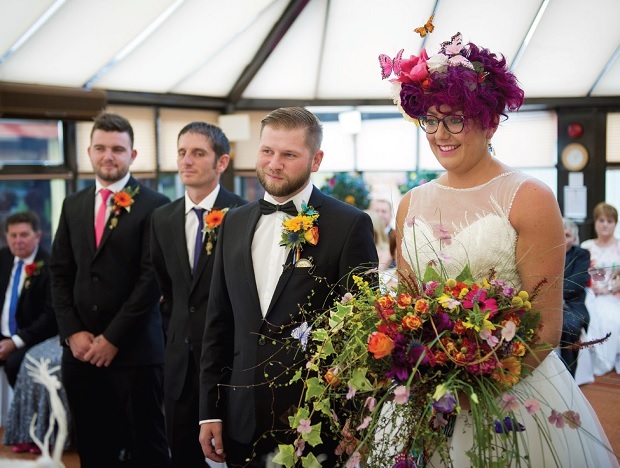 “Our wedding was quirky, magical, full of colour, fun and laughter and we had the time of our lives,” recalls Faye. 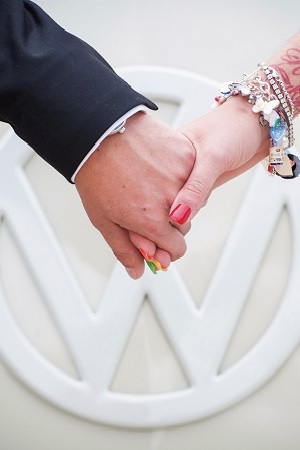 Read on and peek through the looking glass at all the details of their amazing day. My bridesmaid Katie begged me to try this dress on so my family could see me in something more classic. I fell in love with it straight away and wanted to wear it forever. 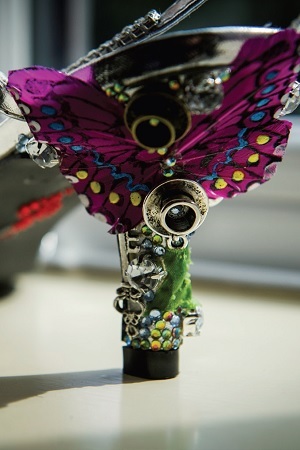 My shoes were personalised with butterflies, teacups and saucers, cutlery and diamantes to the heels. 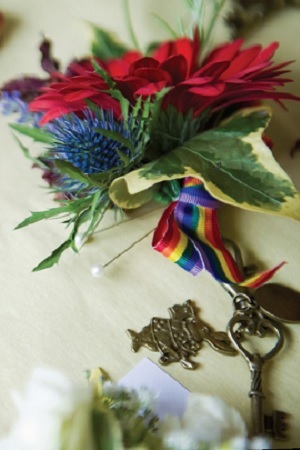 The groomsmen all had colourful buttonholes with Alice charms, and Tom had a beautiful pocket watch. I made my own headdress from fake flowers which I wired onto a metal headband and added butterflies. It looked like the flowers were growing from my head and the butterflies fluttered as I walked. My bouquet was amazing. I opted for a wild look with strands hanging out and really vibrant colours. 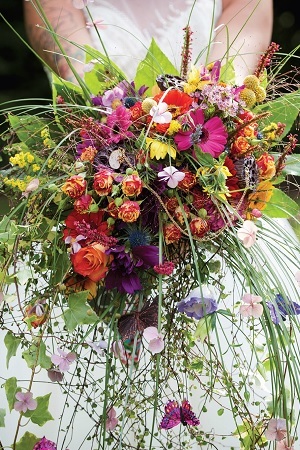 It included a mixture of flowers and grasses with added butterflies and a small clock on a chain. I had a beautiful Alice in Wonderland themed charm bracelet with toadstools and teacups, and my nails were multi-coloured. 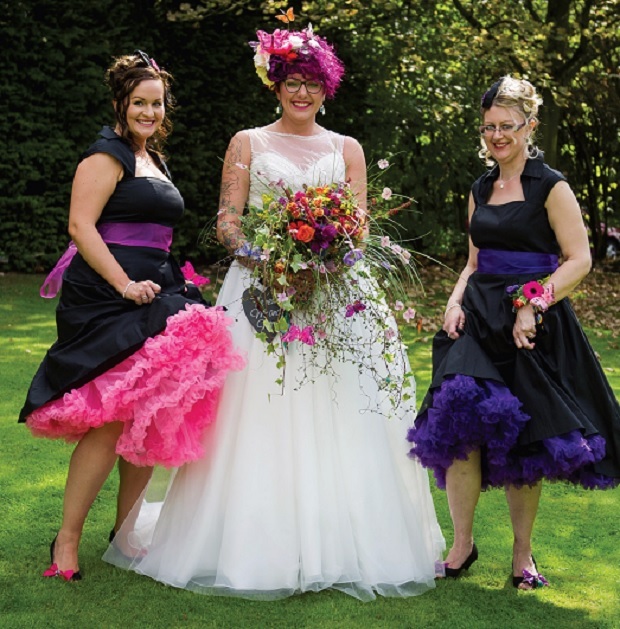 The bridesmaids wore 1950s-style dresses. I wanted black as it would stand out against the coloured petticoats. 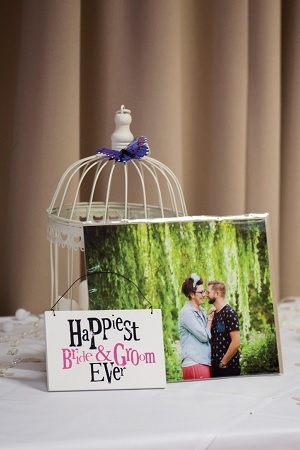 Faye’s top tip: Create a scrapbook of ideas, go to plenty of wedding to inspire you, reflect your personalities and make it about the two of you. 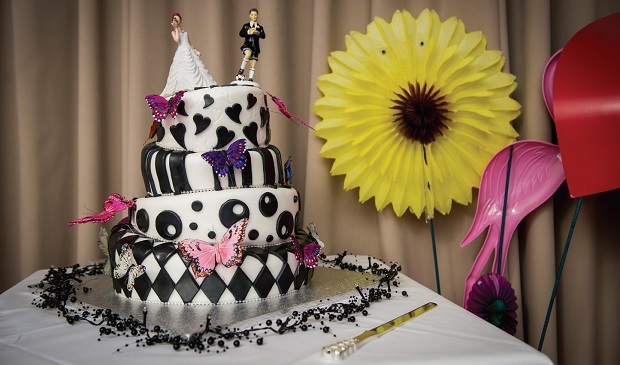 The toppers were a football- themed groom and a bride with purple hair and tattoos. We had a fruit bottom tier, sponge in the middle and red velvet on the top. 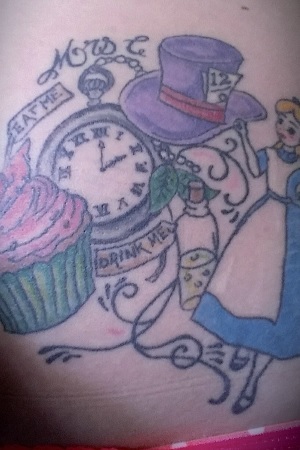 I had a surprise Alice-themed tattoo done for Tom, with a pocket watch with the time of our wedding, a Mad Hatter hat with the date. Tom loved it and it's a constant reminder of our magical day. We used playing cards with guests' names written in gold as place settings. 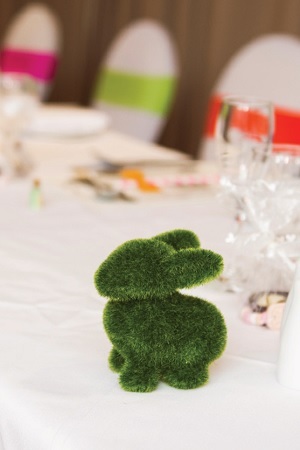 Our wedding favours were chocolate teacups with white chocolate mice and little 'drink me' bottles filled with spirits. 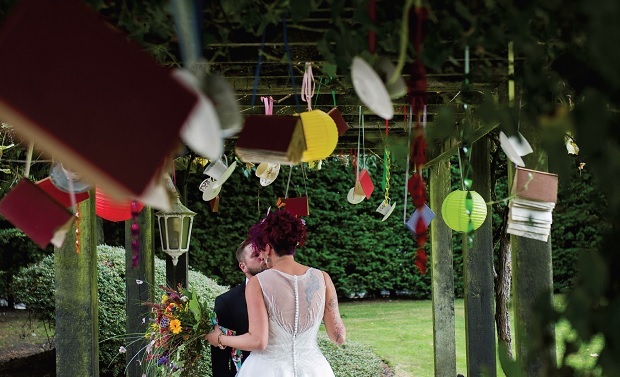 We had teacups and saucers, lanterns and old books hanging outside, which made it look like a scene from a story.